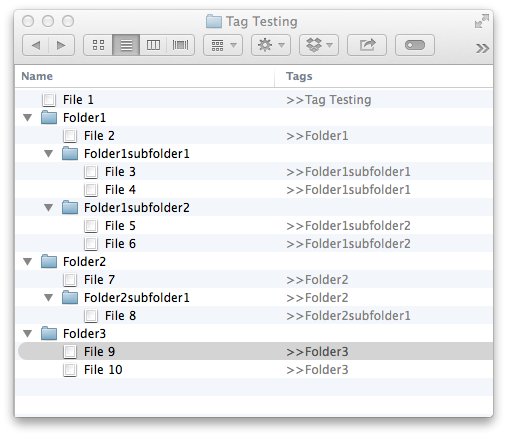 just had an insight on a way to abandon folders for tags and smart folders. This would eliminate my need to file anything. All the files go in one big pile. I've been following discussion on tags and folders. You can see this recent post on Tags vs Folders on Academic Workflows on a Mac via David Sparks. I use folders on a project basis and agree this is a very useful way to find files. I really like the overall design that Brett Terpstra has in his system described here. I read this post by Brett when it came out and I think its been rattling around in my brain until today. So back to the insight. Get hazel to crawl my filing cabinet and add a tag to each file with Name of the folder its in via dynamic tagging. The folder name is the project in essence but with a bit more persistence than the file simply being in a folder. One could therefore imagine the smart folder with this project name for those of us who used to the metaphor. I can now see my way to using this project name tag to be able to sort things and not have to "file" anything. Also, I think this will work nicely with my inbox, now, outbox system. I'll only use folders as temporary holding bins. I created a test bed of 10 files in 3 folders and a couple subfolders. Then I tag each file with the folder name. For the test, I inserted >> in front of the name so I keep this clear of my other tags. Then I created smart folders for each of the tags. Then I tag the smart file sub folders with the tag of the folder they they're in. Here it is in pictures. So excited that it finally sunk in. 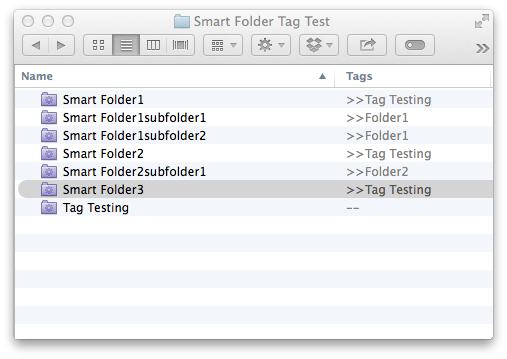 Here's the smart folders I created with the Tags used for the folders. It works! Here is the base folder with the contents that should be there. Oops - cut and paste error in this folder...see below for the fix.